This article was first published in December 2011 in issue 235 of the GMC “Woodturning” magazine. My current arsenal of equipment for holding work on the lathe is probably similar to many other woodturners. I have the basic drive centres and live centres; faceplates and screw chuck; Jacobs chucks and the usual four jaw scroll chucks with an assortment of jaws. Most of these methods of work holding have one thing in common, they all leave tell tale evidence of their use (unless you are very careful or devious!). My usual method of finishing a bowl is to reverse chuck it between a live centre and a suitably shaped piece of wood (with router mat and paper tissue to protect the finish) acting as a friction drive. I turn away as much of the spigot or recess as I can and finish the last bit where the live centre was located by hand, off the lathe. With care, this method allows all evidence of the chucking method to be removed. This way of working has suited me admirably for a number of years so why change now and, more importantly, why a vacuum chuck? Well for me there are at least three reasons (not counting the usual tool junkie argument!). Firstly, there are occasions where I want to remount a piece of work after I have gone to the trouble of removing the means of holding it in a chuck. Secondly, using a vacuum chuck would allow a simpler method of mounting my almost finished work to remove the chucking spigot or recess. Thirdly, removing the constraints of how work is held on the lathe might open up a few different avenues for experimentation. It was the third argument that tipped the balance for me. 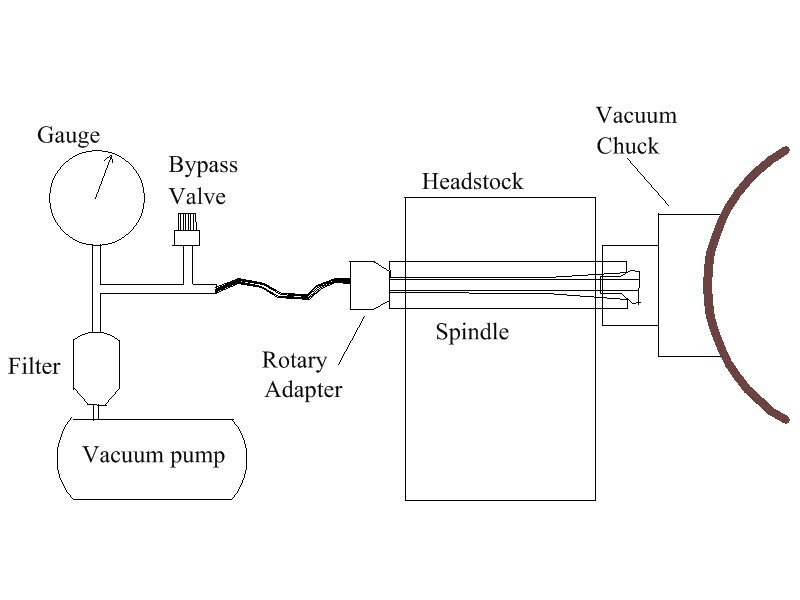 A basic vacuum chuck system might look something like this.